BBC Radio 4 has today announced when audiences will be able to hear the much anticipated first ever dramatisation of Sir Terry Pratchett and Neil Gaiman’s cult classic, Good Omens and John Finnemore’s Cabin Pressure starring Benedict Cumberbatch. The six-part adventure, Good Omens, will begin with a special double-bill on Monday 22nd December at 11.00pm and culminate in an apocalyptic hour-long episode on Saturday 27th December. To accompany the programme there will also be a series of illustrations from graphic artists, including the depictions of Neil and Terry seen in the clip by Si Gurr. Fans can head to www.bbc.co.uk/goodomens to see more. As the drama develops additional illustrations, clips, teasers and photos will be added to the site. 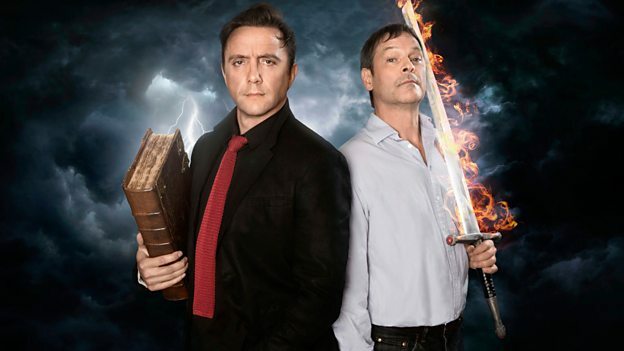 The apocalyptic audio drama has a cast including Mark Heap (Spaced, Green Wing, Stardust), Colin Morgan (Merlin, The Fall), Josie Lawrence (Skins, EastEnders), Clive Russell (Game of Thrones, Ripper Street), Julia Deakin (Spaced, Hot Fuzz), Louise Brealey (BBC’s Sherlock), Charlotte Ritchie (Fresh Meat, Siblings), Simon Jones (Hitchhiker’s Guide to the Galaxy), Arsher Ali (Four Lions, Complicit, Beaver Falls) and Phil Davis (Silk, Whitechapel, Being Human) - to name but a few. Meanwhile, fans of Cabin Pressure will be sky-high with the news that the final ever episode will be a double-bill, airing on BBC Radio 4 on Tuesday 23rd and Wednesday 24th December at 6:30pm. With the show titles running alphabetically from the first ever episode – ‘Abu Dhabi’ through to this double finale – ‘Zurich’, the cast and crew of MJN Air discover that whether it's choosing an ice-cream flavour, putting a princess in a van or remembering your grandmother's name, no job is too small, but many, many jobs are too difficult. Starring Stephanie Cole as Carolyn Knapp-Shappey; Roger Allam as 1st Office Douglas Richardson; Benedict Cumberbatch as Capt. Martin Crieff and writer John Finnemore as Arthur Shappey. Special guests include Anthony Head and Timothy West. Illustrations and images are available for both programmes.